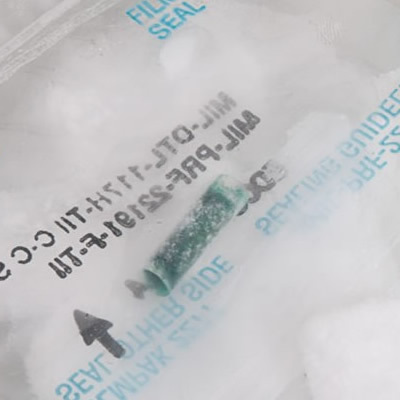 To ensure your PMF adhesives have not been subjected to temperatures above -40° while in transit, Appli-Tec includes an Indicator Tube in all shipments. If your frozen material reaches a temperature above -40° C, the green Indicator Tube will melt. 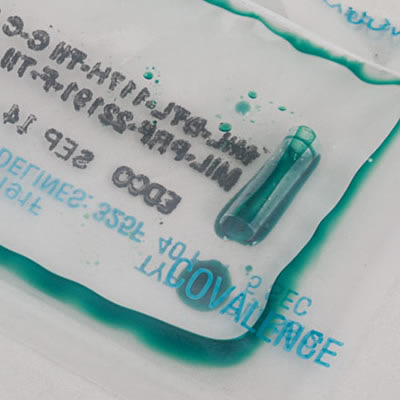 You will either see an empty tube or green liquid leached into the clear envelope. IMPORTANT: If your shipment arrives with a melted Indicator Tube, call Appli-Tec immediately at 603-685-0500. The contents of the box have never been warmer than -40° C.
The contents of the box are now warmer than -40° C.